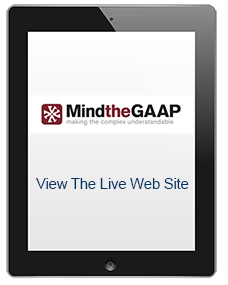 Mind The GAAP is a consulting company that brings proven accounting experience to the training and development field. Changes to U.S. GAAP, IFRS, and from the SEC means that Scott Ehrlich and his team are busy year round. They are a global company serving clients in North America, Europe, Asia, the Middle East, and Australia. Their Web site needed to assist in maintaining clear communication with their clientele across the globe. Joint Digital built the first Web site for Mind the GAAP, and since then, we have been commissioned to build and maintain the next three iterations of their Web site. As Mind the GAAP has expanded, and the needs of their Web site have changed, they continually put their trust in the work that Joint Digital does. The partnership has expanded beyond Web site development and today includes multimedia production and eLearning courses. Some of these collaborations can be seen in Joint Digital’s eLearning portfolio. Built custom site search features and a repository of organized articles. Combined multiple back end services to facilitate improved site and end-user functionality. One of our longest partnerships. Joint digital has handled Web site migration from one Web hosting provider to another as the site requirements have changed. The folks at Joint Digital have excellent instructional design skills, and they are really meticulous – for instance, making sure that their products worked with the underlying LMS before we developed one word of content.